Probably the most intimidating part of swimming pool maintenance is understanding chlorine. What follows is an overview written in plain english so you understand the difference between the three main types of chlorine used. The granular chlorine is used once a week to shock the pool or once a day as a daily dose of sanitizer. A pool shock involves raising the level of chlorine in the water so high that it kills bacteria and neutralizes organic material. The amount you will need depends on the amount of water contained in your pool. You can read the instructions on your chemical container or talk to your dealer for more details. The reason we shock a pool once a week (regular shock) is to ensure the pool is properly sanitized throughout the year. A regular shock is what you’re going to be doing once a week. Most people do it on Sunday night when everybody is done swimming for the day. Shocking is done in the evening after the sun goes down, not during the day (the sun’s ultraviolet rays eat up chlorine). The way you apply granular chlorine to the pool is by using a large pail and fill it with hot water (the exact quantity of water doesn’t matter, just fill the pail). You then add the granular chlorine to the water in the pail (always chlorine in water, never water on chlorine). One the chlorine is dissolved by stirring with a wooden stir stick, slowly pour the liquid around the perimeter of the pool. Try to avoid splashing since the liquid chlorine is a very concentrated chlorine solution that will bleach clothing on contact. It is also very irritating to the skin, so gloves should be worn. Needless to say that getting dissolved chlorine in the eyes is not a good idea. Wear protective glasses if possible and, if a mishap does happen, immediately rinse the eyes with cool clean water (not pool water) and consult a physician immediately. 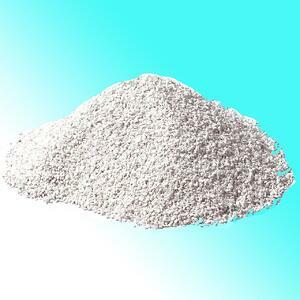 There is also a newer form of granular chlorine available called “HTH Extra”. This form of granular chlorine is specially designed to dissolve on contact with water and as such does not require you to pre-dissolve it. 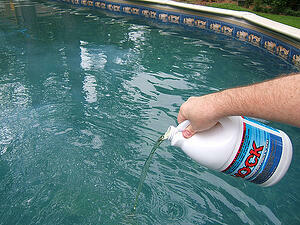 This allows you to add it to the pool directly by sprinkling it on the surface. It's active chlorine concentration is also higher, so you find yourself using less then regular chlorine. Note: If the swimming pool water is cold, we would still recommend you to disolve in water bucket first. It's always a good practise to follow. The reason for chlorine pucks is to reduce the amount of time you need to spend on maintaining your swimming pool. Chlorine is used to keep your pool sanitized and a certain amount (1 – 3 ppm) is required in your pool at all times. 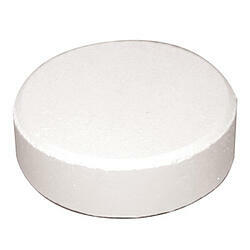 Chlorine pucks were developed to eliminate the need to chlorinate your pool manually every day. They slowly dissolve and create a slower chemical reaction than granular chlorine. With the automatic chlorinator, these pucks can be set to dissolve at a certain rate in order to maintain a constant amount of chlorine in the pool. It is important to remember that chlorine pucks and granular chlorine are NOT the same. Never add Granular Chlorine to Chlorinator. Using the pucks can be a little tricky in the beginning. Again, without getting too technical, it is important not to overuse pucks. Having pucks dissolve too quickly can cause long-term problems with water chemistry, and this, regardless of your pool size. Contact your dealer for more details. Since the automatic chlorinator depends on water pressure to dissolve the pucks and each installation has a slightly different operating pressure, the setting will be slightly different. The best way is to add the appropriate number of pucks and set the automatic chlorinator to about the middle of the dial. Every second day, check the pucks to see how much they have dissolved. Turn the dial down or up according to how fast they dissolved. After a few weeks you will get a very good feeling for what the dial setting should be. Something important to remember is that the pucks will only dissolve when the pump is running. This means that if the pump is on a timer system, the pucks will not be dissolving during the ‘off’ period. This should be taken into account when setting the automatic chlorinator. In some situations, if the pool is being used heavily during a very sunny period, you may find it nearly impossible to keep any chlorine in your pool. First thing to do is to test your chlorine in the morning since, by late afternoon in the summer you will almost never get a proper reading. If you find no chlorine in the morning, do not hesitate to use granular chlorine and give the pool a regular shock (again, remember in the evening). Another sign that your pool might require extra shock is a slimy feeling on the liner. If this occurs, brush the wall and the bottom of the pool and shock it that night since a slimy liner is the first sign of algae. Liquid chlorine can be used in a way that is similar to granular chlorine. The concentration of liquid chlorine is usually at 10% of active chlorine. This is very small compared to 60% - 75% range of the granular option. The advantage of liquid is that you are guaranteed not to have any deposits in the pool, since it is already full disolved. 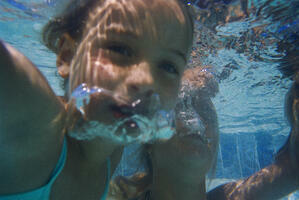 You will find that maintaining the pool with liquid chlorine is much more expensive. We do suggest at times to simply use liquid chlorine as a "boost" option at the beggining of the season, or if you need that extra shock to the pool. Fact is, a well mixed in granular chlorine dose will give you similar results, at a large cost saving. No matter what kind of chlorine you use, make sure to pour it near the water return, NOT the skimmer. The concentration of chlorine is very rough on the filtration system of a swimming pool. By pouring it near the water return, it will allow it to re-circulate.